In the darkest dungeons and the deepest wilderness, mighty heroes stand tall against the horrors of the Mists! 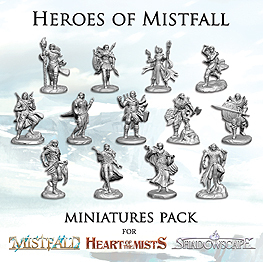 Compatible with Mistfall, Heart of the Mists, and Shadowscape, this set of 13 finely crafted miniatures will make your heroes come to life. Change your party token into a likeness of your favourite hero (Mistfall, Heart of the Mists), upgrade hero tokens to miniatures (Shadowscape), or use these iconic characters in other tabletop games, including your favourite fantasy RPG. Contains 13 detailed, unpainted plastic miniatures. No assembly required.